An expanded version of Maclean’s Miscellany of Whisky, to which nine new chapters have been added, Whisky Tales is an eminently readable and fascinating compendium of ruminations and little-known details collected by MacLean in a quarter century of writing about whisky. With historical notes, songs, poetry, pictures, and sidebars interspersing 29 chapters MacLean has achieved what other writers have only tried when mixing diverse whisky material in a single book. Waymack and Harris, for instance, in their excellent Classic American Whiskeys, proceed neatly through the history, processes and trappings of Bourbon and rye, then clumsily dump a bunch of cocktail recipes at the end, as if to add pages. Andrew Jefford in his brilliant Peat, Smoke and Spirit has written two books then physically combined them into one by alternating chapters on whisky and Islay. It works a lot better, but MacLean, perhaps because he cuts from so many so cloths, has managed, brilliantly, to stitch vastly disparate pieces into a single, cohesive whole. 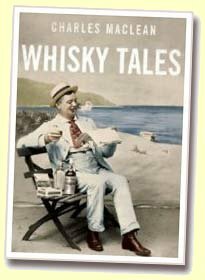 That said, and despite the chapters being neatly sewn together, Whisky Tales is a book that can be opened at almost any page to start reading, for each chapter stands on it’s own. Reader beware though; the just-one-more-page syndrome kicks in pretty quickly. Some chapters are based on lectures MacLean has given over his career, others are re-writes of articles published in lesser-known journals, and each includes gems that just didn’t fit into other of MacLean’s works. The story of whisky and its organically evolving production methods lends an authenticity to whisky as a farm product and whisky-making as a craft. So it is surprising to learn in Whisky Tales, that Welsh whisky is a science experiment. In Wales, free from Scottish whisky regulations, two scientists have designed a whisky still and a whisky process that have allowed Penderyn to produce a fine dram that would likely not even be called whisky if made anywhere else. The only distillery in Wales uses a unique still designed by Dr. David Faraday as a hybrid of the pot and the column, which allows new-make whisky to be ready for the cask after a single run. Quite an energy saving this. With Faraday’s still in place, Dr. Jim Swan had the idea of having Penderyn’s wash prepared off-site at a local brewery, and then suggested introducing lacto-bacillus to generate a range of new flavours during a second, bacterial fermentation. In America, Virginia whiskey, arrives at the distillery as low-wines imported from out of state, and American whiskey in general uses a sour mash process which is the essence of Swan’s lacto-bacillus process. However, for the British Isles this is very unique and it is surprising that the resulting Penderyn whisky is so Scotch malt-like. Smuggling gets but passing coverage in the popular whisky guides, and usually by way of romanticizing it. MacLean gives the reader a brief history of Scottish smuggling before the Excise Act of 1823 helped bring to an end “an episode in Scottish history which is at once brutal and violent, romantic and heroic.” He then ends the chapter with a detailed description of an illicit distillery, clipped from a March 1823 edition of The Scotsman newspaper. In a chapter called “Firing the Stills” MacLean talks about the effects of direct firing, now almost completely gone due to health and safety regulations. According to Whisky Tales the naked flame heats the still unevenly creating a heavier spirit. The uneven heat also leads to some burning on hot spots in the still, which imparts unique character called ’empyreumatic’ to the spirit. MacLean likes words and chooses them respectfully, occasionally giving the reader a brief etymology to aid understanding. This is typical of Whisky Tales – taking a different look at a familiar subject. Illustrated with colour plates and etchings, there’s a feeling of age and substance to the book. Some readers may wonder at a publisher’s decision to release an expanded version of MacLean’s Miscellany under a new name, but there really is a lot of new, rarely-found material here recounted in the same engaging style that made Miscellany such a treat to read.